Members of WISPPA voted at the September 8th meeting to oppose Measure N because passage would mean drastic cuts to many services in our city (see below). 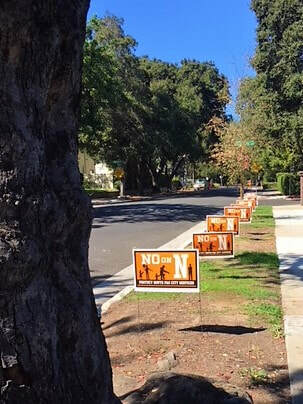 These cuts will radically alter the quality of life that residents of South Pasadena cherish. Three full time Firefighter/ Paramedics to be laid off. This will reduce the number of firefighters assigned per truck from 4 to only 3. School Resource Officer position to be eliminated. Street and sidewalk repair budget to be reduced by $1,260,000. School Crossing Guards to be eliminated. Elimination of an SPPD Captain Position and regional Air Support Contract cancelled. Crime prevention programs and women’s self-defense course eliminated. Three full time SPPD (POLICE) employees and six cadets to be laid off. Tree planting eliminated and trimming reduced to every 6-7 years. Park maintenance including mowing and trash removal cut to only every two weeks. Landscape and Lighting Maintenance District work no longer supplemented by City funds. Community Services Department to be dissolved except for Dial-a-Ride and Senior lunches. Summer Camp and Teen Center programs to be eliminated. Concerts in the Park and Movie nights to be discontinued. Five full time and thirty seven part time City employees to be laid off. Public Library reduced from open 57 hours to 37 hours per week including being closed Sunday and Monday. Children’s Reading Programs, Author nights and movie screenings at Library to be eliminated. Library Capital improvements and technology programs to be unfunded. Community Emergency Response Team (CERT) training to be dramatically reduced or eliminated. Three full time Library employees to be laid off and part time staff drastically reduced. Public Art budget to be eliminated.